Maschinen Krieger ZbV 3000 (or Ma. K.) is developed by Japanese illustrator and modeler Kow Yokoyama (横山 宏). It's a sci-fi universe populated by mechas and robots like they are in a dystopia world in war from some other universe. This book collects the featured pages that previously appeared in the monthy Japanese magazine Model Graphix. That's 30 magazine issues, from January 2006 to December 2010, collected in this 248-page paperback. This is the third volume, and there were two before (Vol 1 and Vol 2). There are also other series of books which seems to feature the models as well. Ma. K. is often mentioned as an inspiration for many mecha modelers. 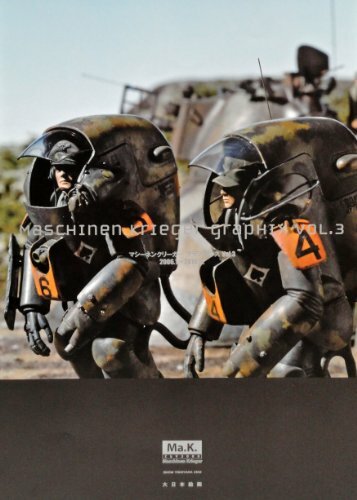 The model kits featured in the book are mainly walking suits. There are a few land vehicles, other walkers but not as much. There are plenty of photos of models, the different parts before assembly, the setup which includes environment, process shots, and also photos from exhibitions and trade shows. There's a good variation of designs featured. All are intricately designed, cast and put together. There are many modelers featured like Naofumi Kadokawa, Heal Saitoh, Genzo Ihara, Hideaki Hirata, Eddy Murao, Kenji Miyama and more. Some of the finished model kits are then painted by Kow Yokoyama. The design emphasis isn't so much on the heavy guns, the artillery, but on the functional aspect and the believability that these things can actually work. Commentary is extensive. Highly recommended to mecha modelers, sculptors and lovers as a source of reference and inspiration.